Hi Sarah, I was just wondering if its safe to treat surgical scars around eyes that resulted from a botched upper blehpharoplasty a few ages ago. If so what needling length can be used? 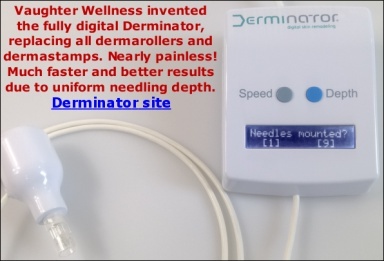 Would single needling be more effective since the scars are in a more delicate area? I've recently started derma rolling with the 0.5mm microneedle and I have to say that my skin tone has noticeably improved. I am however concerned about the pin bleeding that I've experienced several times with my 0.5mm needle. I read online that I shouldn't really be experiencing any bleeds with a 0.5mm length. Does this basically occur cos my skin may be thinner than the average person's? Would it be advisable for me to get a 1.5mm needle for a more aggressive treatment or should I opt for a shorter length needle? You cannot microneedle directly on the eyelids due to the risk of eyeball injury. The thickness of the skin varies, depending on where it resides. The skin on the eyelids is the thinnest on the body. If your scars are outside of the red area on the picture (from the above forum posting) or the skin with your scars can be stretched away from the red area, you can use a 1 mm dermastamp to improve their appearance. It is not completely uncommon to get pinpoint bleeding with a 0.5 mm roller. We have customers who bleed, rolling their face with a 0.5 mm and we also have those who do not bleed at all rolling their face with a 2 mm roller. It depends on skin thickness but also on the density of the vascular network and their proximity to the skin. What exactly are you trying to improve?